Once more, I find myself singing the praises of Flangestock, a small festival of friends held each year, somewhere in Suffolk. To say we were blessed with the weather would be an understatement. Despite being a few weeks into September, the sun shone like it was mid-summer. As the sun set on Saturday, the tent began to fill, as Ryu from Rockit Science performed a great warm up, teasing the crowd along to the point where The Plumps’ ‘Creepshow’ seemed a good starting point to me. About the only part of my set I had planned was to lead with ‘Chariots Of Fire’ by Vangelis, seeing as how it was the year of London2012, but decided it might kill the crowd. From then on, it was just a case of smacking them out and it went down really well. So nice when people keep saying thank you for the set for hours after. Following up on that night was Jung, who smashed it and the mighty collins303, who did another stellar trademark set full of 80’s love and vocals. The crowd finished singing again. Big love to all involved… the djs, the crowd and of course all those who helped organise, especially the one and only Emskina Flange. What a host! So, here we have it. The first mix I’ve released since 2007 and it’s a live one! 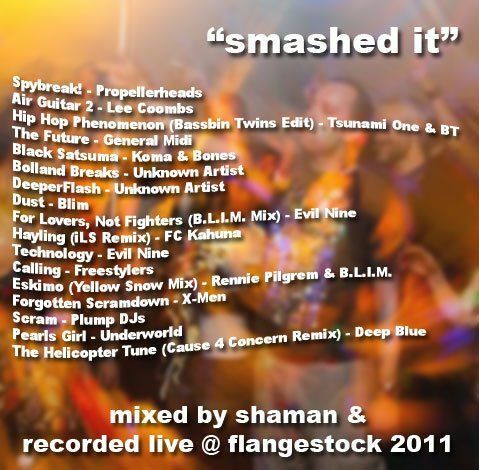 I was lucky enough to be asked to play at Flangestock this year, a small festival/ party with a group of friends on a campsite in Suffolk, that’s now into its 5th year. In many ways, this year was the best so far. It’s so great to spend the weekend with friends, new and old, and there’s a really special vibe there. This year, my only plan for the set was to rip yet more vinyl and create a crate in serato with tunes from 2006 and earlier, mostly breaks, all breakbeat. On the day, I decided to deliver some classic, huge tunes of breaks legend and the reaction was fantastic. This music just has so much more to offer than the modern sound, helped along by the fact that some of these tunes are favourites amongst a crowd that follows breaks. There were a few problems along the way, such as a recurring fluffy needle on one deck, but overall it all went pretty well, considering I’d never practiced this set before. Some things worked, some things just got crowbarred in, but I can safely say I’ve never had a reaction to a set, like the one I got that night. It was so rewarding, and my appreciation goes out to all those that came and danced and cheered, to the producers who made this fantastic music way back when and most importantly of all, to Emskina Flange, who asked me to play. The tracklist is in the image above.